For pregnant women diagnosed with placenta accreta—when all or part of the placenta invades and is inseparable from the uterine wall—a planned cesarean delivery and hysterectomy is the most commonly recommended delivery plan. Delivering the baby and then performing a cesarean hysterectomy with the placenta still in the uterus reduces the mother’s risk of life-threatening hemorrhage, as noted in the American College of Obstetricians and Gynecologists’ (ACOG) most recent committee opinion document on placenta accreta. Of course that reduced morbidity risk during delivery comes at the expense of the mother’s ability to bear children in the future. For some women with a strong desire to have more children, a planned hysterectomy may not be an acceptable option. As an alternative to hysterectomy, interventional radiologists may offer uterine artery balloon occlusion to protect against hemorrhage and preserve the possibility of future pregnancies. In the procedure, the interventional radiologist inserts balloon catheters into the internal iliac arteries feeding the uterus before the C-section delivery. The catheters are inserted through the mother’s femoral arteries before the delivery and can quickly be inflated at first sign of hemorrhage, explains Constantino Peña, MD, medical director of vascular imaging at Baptist Cardiac & Vascular Institute in Miami, which offers the procedure. There are surgical approaches to avoiding hysterectomy too. In some cases, an additional procedure called uterine tamponade is used. This involves inserting and inflating a specialized balloon to fill the inside of the uterus after the baby is delivered. The outward pressure created by the inflated balloon helps control the bleeding. Other procedures used to control obstetrical hemorrhage include uterine compression sutures, iliac artery ligation, and uterine devascularization. Embolization treatment of the arteries feeding the uterus is yet another option. Peña says his practice performs one to two uterine artery balloon occlusions each month. The key challenge to expanding the procedure’s use is building relationships with obstetric and neonatology teams. Interventional radiologists need to be part of the teams that plan these high-risk deliveries or at least make sure these clinicians are aware of the procedure. This requires showing the obstetric community more quality data supporting the procedure’s consideration in these pregnancies. He adds that the procedure probably is better known in hospitals that deal with a larger number of high-risk pregnancies. Like any procedure, the balloon occlusion has potential risks. Reports in the obstetric literature have reported complications such as blockages requiring stent placement or bypass, thromboembolic events, and fistulae, according to the California Maternal Quality Care Collaborative. Peña and other interventionalists are working to provide more data on the procedure. At January’s International Symposium on Endovascular Therapy in Miami, Peña presented results from a study of 35 pregnant women who underwent uterine artery balloon occlusion prior to a C-section. Twenty-four of those women also underwent uterine tamponade. In the study, 26 of the women received blood transfusions averaging 1,870 mL—a blood loss rate much less than the usual 3,000- to 6,000-mL loss for women with placenta accreta. All of the women and infants in the study survived. Seven of the women (18%) ultimately had hysterectomies. Peña noted that sometimes the placenta attaches so deeply into the wall of the uterus that it becomes impossible to remove it without life-threatening blood loss, making hysterectomy the only option. Women who have had undergone previous cesarean delivery are at greater risk of placenta accreta, especially those with placenta previa overlying the previous uterine scar. One study reported that in women with placenta previa who have repeat cesarean deliveries, the risk of placenta accreta increased from 3% to 11% to 40% for the first, second, and third repeat cesarean deliveries, according to a 2006 Obstetrics & Gynecology article. The percentage rose above 60% after four previous cesarean deliveries. The presence of placenta previa alone without previous uterine surgery is associated with a 1% to 5% risk of placenta accreta, according to the ACOG committee opinion. Overall, the current incidence of placenta accreta has been reported at one in approximately 2,500 births and one in 533 births in different studies, according to the ACOG committee opinion. The incidence of placenta accreta has increased over the years, most likely because of the increase in cesarean deliveries. Placenta accreta usually is diagnosed by transvaginal or transabdominal ultrasound exams, supplemented in some cases by MRI, according to the ACOG’s committee opinion. By identifying the condition and planning accordingly, physicians can reduce the mother’s risk and perhaps preserve her fertility. While planning may reduce the mother’s risk and the need for hysterectomy, interventional radiologists are not always part of the team that does the planning. “Many obstetricians know the procedure is available and will plan accordingly, but there is still some need for outreach to make sure doctors know it’s available,” Peña says. He believes developing interventional radiology’s collaborative role is important to the continued development of the specialty. “It shows another way that radiology is involved in patient care—particularly in team care,” he says. 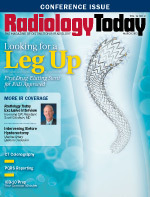 Patients who received minimally invasive treatment with yttrium-90 (Y-90) radioactive beads to treat colorectal cancer liver metastases lived almost one year longer compared with those who received the standard biologic therapy alone, according to data from the annual Symposium on Clinical Interventional Oncology at the International Symposium on Endovascular Therapy in January. “Patients with liver-dominant metastases from colorectal cancer should be offered radioembolization in addition to chemotherapy because it may offer a survival benefit compared with chemotherapy alone,” said Dmitry Goldin, MD, a radiology resident at Beaumont Hospital in Royal Oak, Michigan, and lead author of the study. Patients in the study, on average, survived about 11 to 12 months longer than historical survival estimates for patients who received standard-of-care treatment with modern chemotherapy and biologics alone. In addition to the increased survival, researchers reported that the radioembolization treatment was more successful in patients who hadn’t been treated with the standard biologic therapy, bevacizumab, for at least three months prior to the radioembolization therapy. In the study, 39 patients underwent Y-90 radioembolization, 30 of whom also had received treatment with bevacizumab. Metastatic colorectal cancer patients treated with bevacizumab within the previous three months had a median survival of 30.5 months after diagnosis, but those who either had not received bevacizumab or had been treated more than three months previously had a median survival of 37.9 months. The difference was not statistically significant but also was not part of the study’s original objectives. Goldin said the study raised an interesting question to investigate: Could different timing of the biologic and radiation treatments maximize outcomes? Goldin said bevacizumab reduces arterial capacity and thus blood flow to the tumor. While it’s reasonable to surmise that reduced blood flow would translate to delivering fewer radioactive embolic particles to the tumor site, that hypothesis has not been studied. He said more research is needed to determine whether and how the timing of the biologic treatment and radioembolization could affect outcomes.